Both David O. Russell and Steven Spielberg were attached to direct this film at one point, but Clint Eastwood feels like the right choice. As one of the few notable Conservative directors working in Hollywood today, he seems like a logical choice to helm a film about a modern war hero who served his time in Iraq. Other directors might chose to pass comment on the war itself or the politics behind it, but Eastwood and the script keep the focus on the man. The film is based on the true story of the deadliest sniper in US military history, but like all Hollywood "true stories", many of the details have been altered. Several reviews I've read of this film have been unduly focused on this point and seem to be more of a review of the real Chris Kyle than of this fictionalized movie version of his life. The authors of those reviews seem to me to be the type of critic who would have been more comfortable with the non-Eastwood directed version of the film. 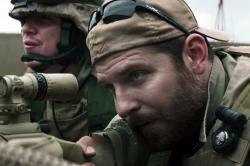 Bradley Cooper, who also produced the film, plays Chris Kyle. After a tense tease of a prologue, the film jumps back to his childhood in Texas where we see him raised by a father with a strict moral code who teaches him to hunt and to protect others. After a brief stint as a rodeo cowboy, he joins the Navy Seals and trains as a sniper. He serves four tours of duty in Iraq with time home in between each stint. In Iraq he is a deadly killer known as the Legend and with a bounty on his head. Back home he is a husband and father. The contrast between these two personas is difficult for him to come to terms with, especially with his macho upbringing where asking for emotional or mental help is seen as a weakness. Cooper, who has gone from just a pretty face to genuine actor and movie star, clearly threw himself into the part. He bulked up considerably and speaks with a Texan accent. His character is stoic, but the emotion is there and Cooper conveys what's happening on the inside of this seemingly straightforward character. Eastwood directs the action scenes very well. The best moments take place with Kyle behind the telescopic lens of his high-powered rifle. Those moments when he must choose life or death for those he has in his sights are quite tense. There are other more action packed and full out battle scenes, but it's these quieter moments, when Kyle and another soldier are crouched on a roof that will stay with you. To give Kyle's tours a story arc, a rival sniper was created who plagues Kyle's unit throughout the film, leading to the inevitable final showdown. The story walks a fine line. It's a patriotic film that shows our military in a good light, being made up of earnest young men out to accomplish something positive. At the same time however, it doesn't neglect the fact that war is hell and can have a traumatic effect on those who take part in it. This dual theme is a delicate one, but Eastwood and Cooper maintain the balance from beginning to end. Bradley Cooper gives a riveting performance as real life American hero Chris Kyle. Much has been made of the fact that he gained 40 pounds and spent months mastering a Texas accent for the role, but those are mere accoutrements. Cooper really gets under the skin of this man. He's a larger than life legend to his fellow soldiers but a tormented individual at home. A man who finds it incredibly difficult to express his emotions or to admit the need for any psychological help. I agree with Scott that the best moments are when Chris has human targets in his sights. The conflicted expressions that flicker across Cooper's face really bring home the human dilemma he faces; especially when the enemy he is deciding whether or not to kill is a woman or a child. By contrast his scenes stateside show a man emotionally crippled. He's like a sleepwalker going through the motions but unable to truly connect with his wife and children. I was less enamored of the battle scenes, which I felt were a bit jumbled. Eastwood's direction is somewhat disjointed and the editing is at times annoying. There are very few extended scenes. The entire movie is a series of very quick cuts and edits. 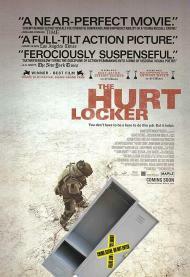 This was also one of my main complaints about The Hurt Locker, which this film is drawing comparisons to. I guess it is the preferred modern way to show battle scenes but I much prefer the old-fashioned style. Modern warfare is a very different animal from past armed conflicts. This is perhaps best exemplified in the scenes where Chris is in the middle of a battle while talking on the phone to his wife at home (see photo). Technology has brought the entire world much closer together. Can you imagine how frustrating it must be to be able to hear your loved one's voice in real time but be absolutely powerless to help them? As Scott wrote, American Sniper manages to be both pro-military and anti-war at the same time. It doesn't shy away from showing these men warts and all. For example they constantly refer to the enemy as savages. And in one scene they fail to protect an Iraqi informant whose son is brutally tortured in front of him as payback for his cooperating with the American forces. The emotional price of war is powerfully brought home at the movie's conclusion. I was unaware of Chris Kyle's sadly ironic fate but it makes for an extremely powerful denouement. American Sniper is a solid war movie built around a career defining performance by Bradley Cooper. My brothers and I have each watched thousands of movies, with our opinions varying on many of them. That is the beauty of movies. There are so many and no rules about which must be liked and which ones not. Movies speak to the individual based on subject matter and the personal experiences and views of the observer. I cannot fathom that my brothers did not give American Sniper 4 stars but then again, it simply spoke to me in ways that other films have spoken to them, c'est la vie. It has rarely been my experience that an audience acted as it did when this film ended. As the funeral for Chris Kyle was playing as background for the closing credits, everyone in the near packed theater sat is orderly silence. When that ended, everyone filed out, again in respectful silence, mourning for the great American we just had the privilege to learn more about. Unlike Patrick, I have known who Kyle was for years. He was long discussed on conservative talk radio and made the talk show rounds when promoting his book. He even appeared on a horrible television show where real military service members coached B stars in military type competitions. His death was quite startling to me, especially the irony of it. Also worth noting is that President Obama has never made a public comment, either personally or through a spokes mouth about Kyle’s passing. Odd that his press secretary Jay Carney said, “…his thoughts and prayers are with her family, especially her daughter. It’s a tragedy to lose somebody so talented at such a young age.” About a singer who killed herself with illegal drugs but not even a nod to a man who defended the country Obama is supposedly the leader of. Chris Kyle may be a polarizing figure but the beauty of American Sniper is that this war hero remains very human throughout the film. He is shown killing many people but he never becomes some superhero action star. Every time he killed, Kyle justified it as saving some other American’s life. He bottled it all up and can handle it very easily when in country surrounded by his fellow SEALS. It was when he came home that he struggled to maintain his compartmentalized issues. I am not sure if it has to do with his macho upbringing, as Scott suggests, but the sniping had an obvious negative affect on him, as Patrick noted. I am guessing that it is why he went back for more tours than he had to. He was more comfortable with who he was in a place that understood him than in one that pestered him with questions. His wife wanted so very much for him to open up but I believe he was scared to tell her all that he experienced. It is a common problem with soldiers throughout the past century, thus VFWs exist where ex-soldiers can gather among people with similar experiences and not feel judged. As Scott mentioned, some of the war action has been “Hollywood-ized” but that is not the point of the film. We watch as a very determined, patriotic man joins the most elite military force on Earth and becomes one of their deadliest. We also see his personal side. He ignored a girlfriend who had affairs on him. He meets and falls in love with Taya, whom he is shown being tender and patient with. 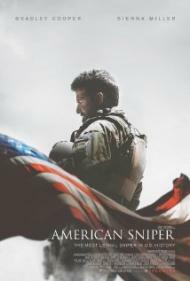 It is in the heartfelt comparisons between the gentle family man and the deadly soldier that American Sniper beats strongest. While at a pregnancy appointment, we discover that Kyle has high blood pressure. His body is away from war but his mind is not. He put up a front for his wife but he never fooled her. Patrick mentioned and explained a couple of the best scenes in the film, where Kyle is on the phone with his wife, while a battle is going on. Here are moments where his two worlds collided. In an early scene he loses the phone and engages the enemy, while his panic stricken wife listens in. 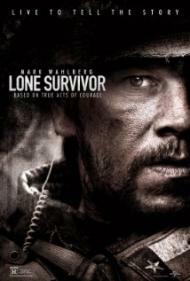 Near the end of the film, in another battle, he has a near emotional breakdown telling his wife over the phone that he is ready to come home. I was shedding man tears. Like my brothers, I was amazed by Bradley Cooper’s performance, riveting indeed Patrick. I forgot I was watching an actor from the start. In interviews, Cooper has stated that he met with Kyle once before his death and planned to hire him as an advisor on the movie. I doubt it would have helped his performance any, as Cooper is nothing less than perfect in the role. I only hope the Academy sees it that way as well, but that is just my opinion.